Fridays can be rough, especially at the end of a particularly tough week. So we at Mortech have decided to start something new and fun on Fridays, and subsequently give people a little peek into the "who" of Mortech. So every Friday we'll be posting a different personal bio from some of the lovely folks here at Mortech, and we hope that you can get to know a little more about us and who we are. This week, we're showcasing Customer Support team leader and Account Manager Dennis Lollman. 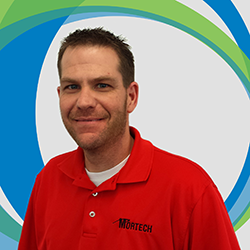 Dennis has been working here at Mortech for 8 years. He has three children with his wife Katie, 10 year-old Emma, 4 year-old Isaac, and 2 year-old Blake. They also have three pets, an Australian Shepard/Lab mix and two cats. Favorite things to do on his days off: camping with family and in-laws, taking his daughter to various dance classes, or working in his vegetable garden and making salsa. Favorite time of the year: Fall, when time can be spent watching Husker and Iowa football on T.V. Favorite thing about working at Mortech/Zillow: The culture and office atmosphere is pretty amazing. There is a lot of collaboration, which makes working fun, as well as the ability to get away for a few minutes and play Ping-Pong or video games. Favorite feature of Marksman: The lead management tools. We’re always working to make them better, but that's the piece that separates us from the competition. We don’t rely on outside integrations to market our clients. They can do it all in one system, and rarely is a deal done in a day, so continuous dripping and following up is vital. Marksman Insider Tip: Do not get overwhelmed with the options in Marksman. We try to make the system as flexible as possible, so have an idea of what you want to do, and take your time setting it up. The options, then, will not seem nearly so intimidating.